Pam Ann Marketing was hired to professionally manage AdWords for a dermatologist practice with four individual office locations along the entire east coast. With no historical account content to audit and improve upon, we conducted extensive keyword and market research to identify the optimal strategy for generating results. This research, coupled with general practice information and dermatology insights from the client, enabled us to construct AdWords content for all locations. Despite total account spend remaining relatively constant (only $8.73 variance), and CPC decreasing by a small factor of $0.41, clicks actually increased by 9.39%. This jump in ad clicks can be attributed to our refinement of the ad targeting and optimizing the ads to show to the exact right audience. By evaluating the three month change in conversion data, we can see that there was an exponential increase in click conversions when compared to extra volume of clicks. A 9.39% increase in clicks generated a 58.02% increase in conversions, and cost-per-conversion efficiency improved 36.66%. After three full months, the client was spending the same monthly budget to generate 58% more leads. By measuring the pacing of the conversions and conversion efficiency throughout the following months, in conjunction with refining the quality of website clicks, we continued to provide hundreds of inbound leads to the four dermatology offices through our management of the AdWords account. Prior to our account management, this account was managed and optimized by a hybrid effort comprised of 1. A different agency and 2. An in-house specialist under the consultation of Google AdWords representatives. After conducting an extensive audit of historical account performance, coupled with website product research, we built brand new AdWords campaigns centralized around the company brand and its core specializations. By utilizing match-specific keyword types, aggressive negative keyword lists, and tested ad copy concepts, we were able to generate high keyword quality scores and positive user experience. 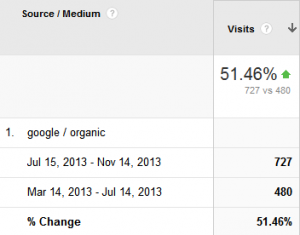 89% increase in month-over-month conversions (from 35 to 66 total conversions). A $9.33 decrease in cost per conversion, which represents a 28% increase in conversion cost efficiency. 3.23% increase in click conversion rate, indicating a significantly higher quality website visitor and positive improvement to overall user experience. The client is a firm believer in long term commitments to drive results, and has expressed a desire to increase advertising spend as the ads continue to generate positive ROI. We were hired to overhaul an e-commerce account that the owners were managing internally since 2002. We started with a strategy meeting to identify highest volume and highest margin product segments, and then conducted a full-scale audit of the existing AdWords account to pinpoint strategy for imperative optimizations. Eliminate wasteful spending on non-converting content. Aggressive segmentation of existing campaign content starting with the discussed products and branching out over time. Improve user experience and e-commerce conversion rates through use of granular and segmented account structure, product specific landing pages, and dynamic search ads. By applying that strategy and re-launching content, we produced the following month-over-month results after just two months of professional account management. Despite a $0.07 higher cost-per-click, total monthly advertising cost decreased by almost 30% and the e-commerce metrics all improved substantially. In this case, because of the large increase in revenue, a decrease in website clicks is not of concern as this is a classic example of quality over quantity with reference to website traffic. Highlights include a 66.13% increase in total sales transactions, 118.71% increase in e-commerce conversion rate, and a whopping 133.70% increase in transaction revenue. The client spent $2699.38 LESS, yet had $8992.09 MORE in sales. This represents a 231% increase in e-commerce revenue/transaction value. In the second month of management, the same trending of less clicks and higher cost-per-click continues, along with even more improvement in e-commerce performance. By refining the account even more in month two, we were able to eliminate more waste and drive even more sales for less cost. Significant month three improvement include a 336.48% jump in e-commerce transaction rate and a $5948.17 increase in revenue despite spending $146.24 less in ads. Since project launch, the client has spent 45.33% less, yet has a 222.14% increase in revenue. The client is exceptionally pleased with early results and is eager to continue working with Pam Ann Marketing to drive more of the same actions long-term. In the ninth month after we began providing SEO services for a multi-location medical clinic, the clinic’s website was getting nearly 200% more organic search traffic than the month when SEO efforts began. We began our efforts in September 2014 with comprehensive SEO research and planning, including a technical audit, keyword research, content strategy, and link research. In November of 2014, we transitioned into an ongoing implementation routine where the results of our planning were put into play. 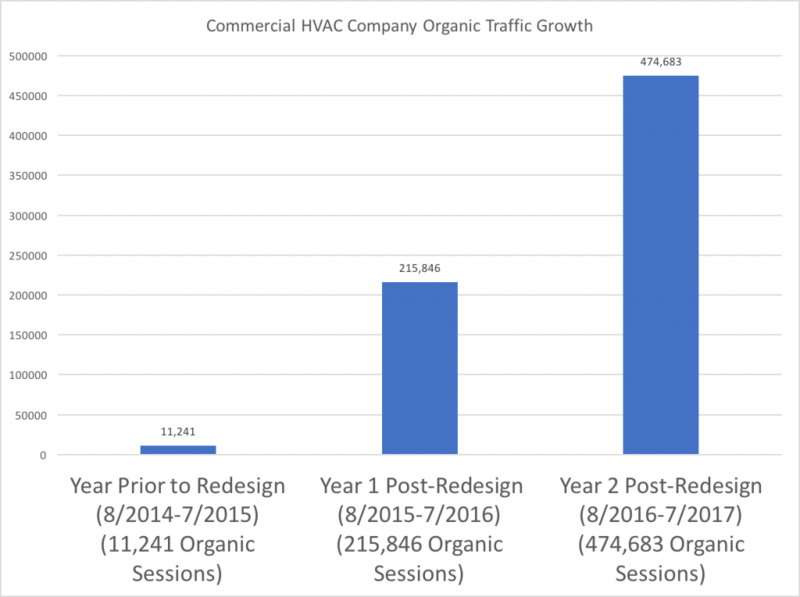 As of July 2015, 9 months after SEO efforts kicked off, the site was seeing nearly 200% more organic search traffic versus the kickoff month. 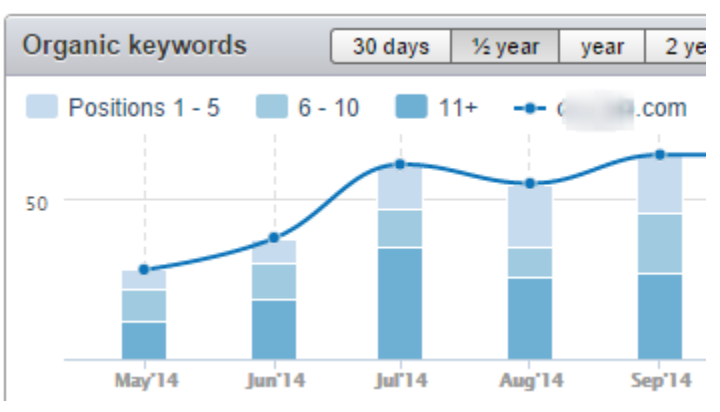 The kickoff month had approximately 9K organic search visits, whereas the comparison month saw nearly 27K. 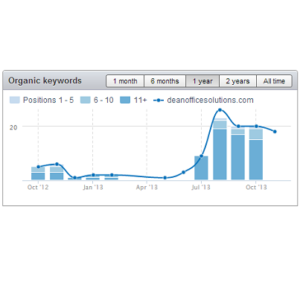 This site’s organic search traffic continues to steadily increase month-over-month. After a few more months of continued implementation, this site is now seeing organic traffic numbers that are 482% higher than when we began. In the sixth month after we kicked off SEO services for a children’s online clothing retailer, the site was getting 405% more organic search traffic than the month when SEO efforts began. As always, we started with comprehensive SEO research efforts, including a thorough technical audit, extensive keyword research, content strategy development, and link acquisition research. Those efforts kicked off late September 2014. In mid-November of 2014, we transitioned into an ongoing implementation phase where the research and planning was put into motion. As of March 2015, 6 months after SEO efforts kicked off, the site was seeing 405% more organic search traffic versus the kickoff month. After completing a comprehensive audit and research phase, we developed an SEO Strategy Plan for an industrial manufacturing company, and then moved into an implementation phase where we worked with their in-house web developer to begin implementing the recommended technical changes, crafted new keyword-optimized content for the website, and began link and social signal building efforts. The client was very satisfied with the results and requested a proposal for a similar initiative for another company they are acquiring. After completing a comprehensive audit and research phase, we developed an SEO Strategy Plan for a legal services company. Since they had in-house staff handling their SEO, after developing the strategy, we moved into a 6 month training phase where we taught the in-house staff how to implement our strategy. 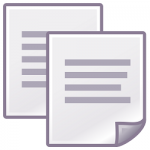 The client was very satisfied with the results and requested additional ongoing consulting. After completing a comprehensive SEO research and planning phase, we managed the redesign of a website for a local copier dealer. The intent behind the redesign was to make the site more search engine friendly. Here at Pam Ann Marketing, we recently did a “local SEO” project for Morristown, NJ-based IT firm Sterling Rose LLC. We did some maps optimization, Schema markup, and citation building for owner Norman Rosenthal to give him a “boost” in regionally-based searches. By implementing these tactics, we laid the foundation for increased local search exposure, but the rest of the work was up to the client. We advised Norm to ask his clients to write reviews for him on his Google Local (Maps) listing to complete the optimization process. Well, Norm hit the ground running and quickly got 12 (genuine) positive reviews on his Google Local listing. His listing then jumped from position #14 to #1 for “it support” on Google Local, from zero to #2 for “it support mac” on Google Local, and #4 for “it support” in regular (organic) Google search results. We love when a client fully embraces our suggestions! 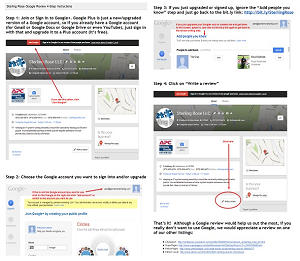 But the key takeaway here is that the client has an important role to play in local search optimization efforts. Engaging an agency to provide local SEO services is essential in order to tackle the technical and tedious tasks such as Schema markup and citation building, but no agency can provide the GENUINE positive results needed in order to effectively increase a company’s regional online footprint. Sure, the agency could ask the client’s customers to write reviews, but the customers won’t be nearly as compelled to do so for some agency they may never have heard of, versus getting a sincere request from the business owner that they have built a mutually-beneficial relationship with. Yes, I intended to indicate that I’m yelling by capitalizing “HAVE TO BE GENUINE”, because fake online reviews are not only ineffective, but can actually hurt your rankings AND bank account. Both agencies AND clients are being fined up to $100,000 for this local SEO technique, as it is a deceptive advertising practice. Even private lawsuits have begun popping up – Yelp has started to sue both agencies and users for posting fake reviews. At the very least you may suffer irrecoverable algorithmic penalties by the sites such as Yelp that control your online reputation destiny. It should go without saying that keeping your customers satisfied is a preclusion to getting them to write positive reviews. However, many companies are already focused on keeping their clients happy – yet they are not maximizing the payoff of those efforts by solidifying that happiness into a valuable online asset. A set of glowing reviews will grease the gears of the search engines to greatly increase your exposure in regionally-based searches. Combine that with the powerful effect of word-of-mouth, and online reviews practically deserve a place under “assets” on a company’s balance sheet. What Are Your Review-Recruiting Challenges? Soliciting reviews isn’t always easy, even from the happiest of customers. Norm will attest to that, but we helped him get over some of those challenges by creating this customized 4-Step Guide to Writing a Google Local Review that he can send to his customers to assist them in the not-very-user-friendly process of writing a Google Local Review. We also created a shortened URL for his Google Local listing (http://bit.ly/SterlingRose) so that he could more easily direct his customers to his listing, instead of having to use the default gobbly-gook URL (yes, that’s a technical term). So don’t get discouraged if you encounter a hurdle or two in this process – there are tips and tricks to get around them. What challenges have you encountered when trying to solicit online reviews? Leave a comment below and we’ll see if we can help you, too.